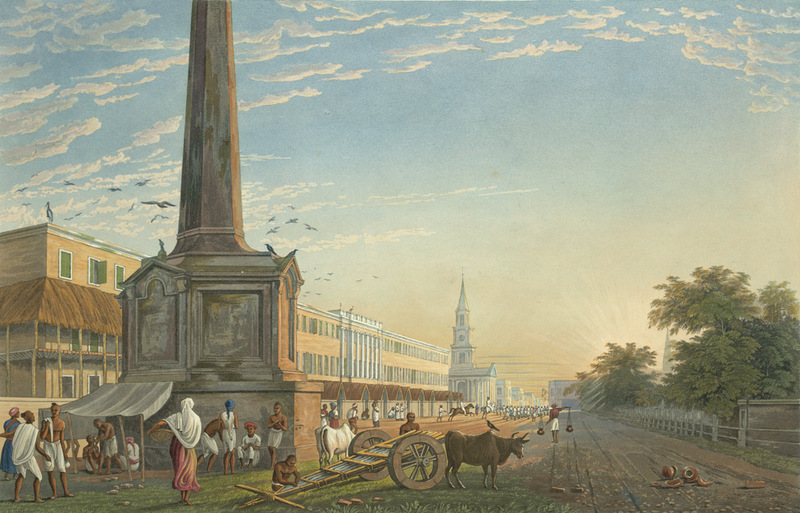 This is plate 6 from James Baillie Fraser's 'Views of Calcutta and its Environs'. Fraser (1783-1856) arrived in Calcutta in 1814 and in six years produced these animated sketches of the busy city, published later as a collection of twenty-four superbly aquatinted plates. The accompanying text reads: "[Fraser's] view at sunrise from the west of the Writer's Buildings shows us a close-up of the Holwell monument to the Black Hole now in the last years of its existence. It was taken down by the order of the Marquess of Hastings in 1821, on the grounds of its increasing unsightliness. Built only of brick and plaster, it had also obviously become a kind of lounging place, where barbers plied thier trade. An impromptu verandah has been added all along the facade of Writer's Buildings. At the far end of the square we catch our first glimpse of the new St. Andrew's Church."